Enterprise resource planning (ERP) is an innovative tool for any business organization that allows them to manage the core business using an integrated application system in the areas covering the field of technology, services and human resources. ERP software integrates all facets of an operation including product planning, development, manufacturing, sales and marketing. The Enterprise Resource Planning is software which is specially designed for the organization to handle the financial data on a large scale and it also helps to improve the overall working efficiency of the organizations. The ERP refers to automation and integration of a core business of the company that helps them to focus on effectiveness & simplified success. The ERP is very effective in various areas of the organizations like operation, sales, marketing and inventory records. The system application provides well mannered services to all the departments of the organization. This software is compatible for all the organizations that will increase the overall performance of the organization. Central databases that are managed by the authorized user. The ERP is a framework that maintains the business information and automates all the activities towards the business reports. 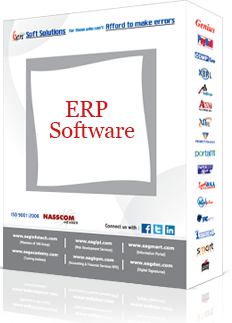 ERP is the backbone of the organization that manages the facilities of the departments. The ERP provides financial data and quality reports. It analyse the quality of the reports. The ERP is flexible enough to handle the business data and inventory reports of the organization and it stores the records in encrypted form. The ERP is ensured for a security that allows the authorized user to access the data by using a valid pass code. This system collects and builds data from various departments of the organization. All the important information or data are stored in an Encrypted form. The database management system handles all information about the organization. It allows various departments of the organization to communicate with each other, and you can access information as well. Provides connection between various departments. You can share data with other department. Copyright © 2019-20 SAG Infotech Pvt Ltd. All Rights Reserved.